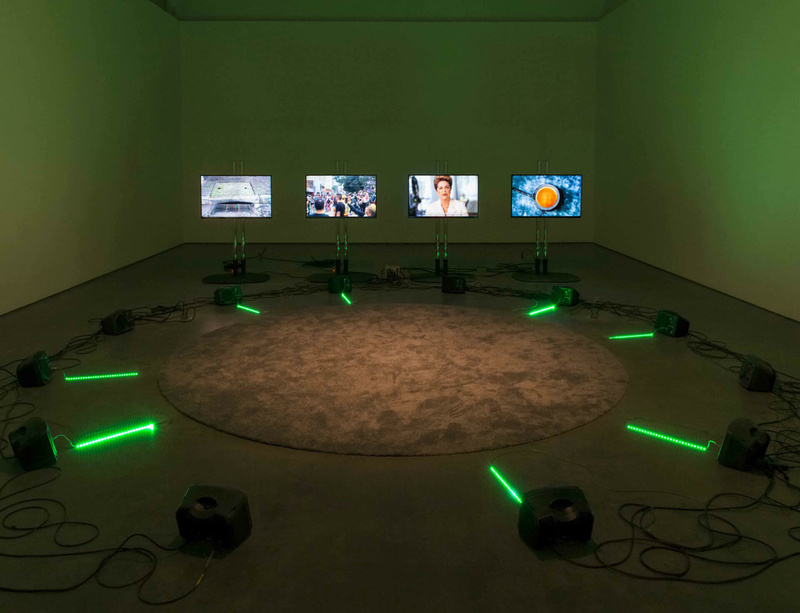 For his first solo exhibition with Lisson Gallery New York and to launch a second space in the city, British artist Haroon Mirza presents an installation highlighting his recent exploration of the perceptual distinctions between noise, sound and light as experienced through the transformative use of psychotropic plants. ããã – Fear of the Unknown remix inaugurates Lisson Gallery’s new venue in New York, five blocks south of the gallery’s location under the High Line on 24th Street, which opened in May 2016. The new installation continues the themes Mirza began to explore during a two-month residency at PIVÔ in São Paulo, Brazil, last year. For the iteration at Lisson Gallery Tenth Avenue, ããã – Fear of the Unknown remix draws on his work in Brazil and integrates new footage and subject matter which addresses the current global political climate. The video discusses the seismic events that have occurred internationally over the course of the past fifteen years—from the terrorist attack on September 11, 2011 in New York, to the conclusion of the recent United States presidential election on November 9, 2016. Following the opening of the first New York location at 504 West 24th Street in May 2016, 136 Tenth Avenue expands Lisson Gallery’s commitment to the city and will allow an additional 3,500 square foot venue for programming intimate exhibitions for its rich and diverse artist roster. The building has been renovated by Studio Christian Wassmann, the architect who, along with Studio MDA, is responsible for Lisson Gallery’s purpose-built space under the High Line. It will remain consistent with the aesthetic in all other locations. An exhibition of paintings on paper and prints by Carmen Herrera will open during Frieze New York (May – August 2017).